Facebook is a rewarding way to build a following for your rescue organization. Social media opens up a wide world of support in all aspects of rescue. It’s a great tool to find volunteers, transporter, donors, fundraisers, sponsors, networkers, and a huge heap of moral support. Whether you refer to them as followers, likes, supporters, fans, or friends, the Facebook community is strong and passionate. Let them propel your rescue into the public view. The first step is to create a public Facebook page for your rescue organization. A great example of a public Facebook page is Hog Haven Farm. Check out the setup of the page they setup for their rescue organization. https://www.facebook.com/hoghavenfarm. You’ll see in a short time they gained over 1,000 fans. Esther the Wonder Pig has a massive following of well over 300k fans, check out her page for more great ideas. www.facebook.com/estherthewonderpig. Let’s explore what works for building a rescue Facebook following and how your rescue can benefit. Provide ample information on the rescue’s Facebook page “About” section. Include important information such as website, phone number, email address, mailing address, and a description of the organization. Explain what your rescue organization provides, your mission, why you started, what your goals are, and what makes you stand out from others. Include your nonprofit status if applicable. Bright, crisp, eye catching photos draw people in and hook their interest. Beautiful close up photos of the rescued or adoptable pigs get your followers emotionally invested. Scenery pictures of green grass, quaint pig houses and peaceful sunsets show the public how well cared for pigs are at your rescue. Happy smiling photos of pigs and/or pigs with people will brighten anyone’s day. Avoid photos that are low quality, hard to see, blurry, too dark, or show a lot of clutter. Make sure water is clean and living conditions are appropriate. Frequent stories or hellos from rescue residents help people feel connected to the rescue and animals. When posting photos or stories use the pig’s names often. Everyone has their favorite “pig celebrities”. Use this public platform to turn rescued residents into celebrities with their own fans. The most mundane events throughout the day can become an internet sensation while capturing hearts across the world. Popular photos show pig’s living the good life. A pig taking a stroll on a leash, or enjoying watermelon or pumpkin, a pig at meal time, a pig sitting for treats, taking a dip in a clean kiddie pool. Featured adoptable pigs several times a week. A quick close up face photo with “I’m Adoptable! !” Or “Adopt Me!” with a caption asking friends to share. This is a double-win as it helps get exposure for adoptable animals while bringing in new friends/followers. Fundraisers are huge hits on Facebook. People WANT to support reputable rescue organizations. They often don’t know how, or where to start. Fundraisers make it easy and fun for them to give. The bonus is these fundraisers are often shared across the pig community, bringing in new exposure and fans for your rescue. Fundraisers provide ample opportunities for posting. The actual fundraiser makes a great post in itself. Also ask fans or friends to share their pictures from the fundraiser – they can wear their rescue t-shirts or show off their rescue car decals. If they won items in an auction, they can post photos of their goodies being used or opening their packages. This is GREAT for morale and interaction. Reach out to potential volunteers and let your needs be known. There’s a tremendous amount of people that are interested in helping rescues in various ways. They have an assortment of professional skills, free time, passion, enthusiasm, advice, or brute strength. You will be surprised at the number of people that WANT to help but haven’t taken the initiative. Present the opportunity for them! Schedule work days at the rescue. Ask for transport volunteers. Post your foster or volunteer application. Ask for Facebook savvy friends that want to manage the Facebook page. Make a post looking for photographers to photograph the farm, adoptable pigs, volunteer days, or rescue efforts in action. Ask if anyone is interested in being a “Dedicated Networker” or coin some other term for the position. Present an opportunity for individuals to come to the rescue for regular feeding duties, or for cleanup, or to build barns or repair fencing. Setup a hoof trimming day and ask for volunteers to assist physically. Ask people to keep their eyes out for free pumpkins after Halloween for the pigs. Ask someone to organize a blanket drive for the pigs. Engage the community by asking for and posting pictures of shirts or decals that you sold during fundraisers. Contests are a great way to engage the community. You can have guessing contests, naming contests, photo contests, essay contests, or anything else you can think of! Quizzes, jokes, trivia, and an assortment of other ideas are great as well. Encourage people to click, comment, and share. Connect website and other social media outlets for more exposure. This also shows that your organization is legit. Post links to your website on Facebook occasionally. 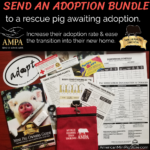 Specific pages, such as Adoptable Pigs, or Sponsor A Pig Program, or Donate, or educational blogs are great ways to promote your website through Facebook. Also connect posts from Instagram or Twitter to your Facebook with “Follow us on IG!” with a link. Heart tugging stories with a happy ending. Nobody wants to see sadness and heartache all the time. However, heart wrenching stories are part of the rescue world. Share these stories with your followers intermingled with stories of success and triumph! Make your page an uplifting place to visit, with a peek into the harsh world of rescue. Progress stories with photos show your followers how you are helping pigs. Whether they had mange mites, malnutrition, obesity, starvation, aggression, or insecurities, you can SHOW what a difference you have made in that pig’s life. This inspires others to rescue, adopt, sponsor, support, and share. Plus, it makes everyone feel good. Great creative and think outside the box! Choose a rescue resident to offer a Tip or Fact of the Week as an educational post “from the pigs”. Hold giveaways for small items. Rack your brain and try something DIFFERENT! Don’t lose the momentum! Facebook works funny sometimes. While you may have 1,000 fans or “likes” a single post may be viewed by 100 people or 100,000 people! The key to success is interaction. Every time someone interacts with one of your posts, by clicking, liking, or sharing, Facebook will show them MORE of your future posts. If someone does not interact with your page or click often then they will not see your posts anymore even though they do “like” your page. It’s confusing and frustrating… but the bottom line is interactions with your page gives it far more exposure. This is where contests come in handy! With each important post, ask your followers to “share” the post.